Devastating wildfires have burned through California’s wine country since October 8, 2017, taking dozens of lives and leaving thousands of people homeless. Even communities distant from the fires have been plagued by poor air quality, as the smoke plumes have darkened skies and canceled school and other activities across the region. 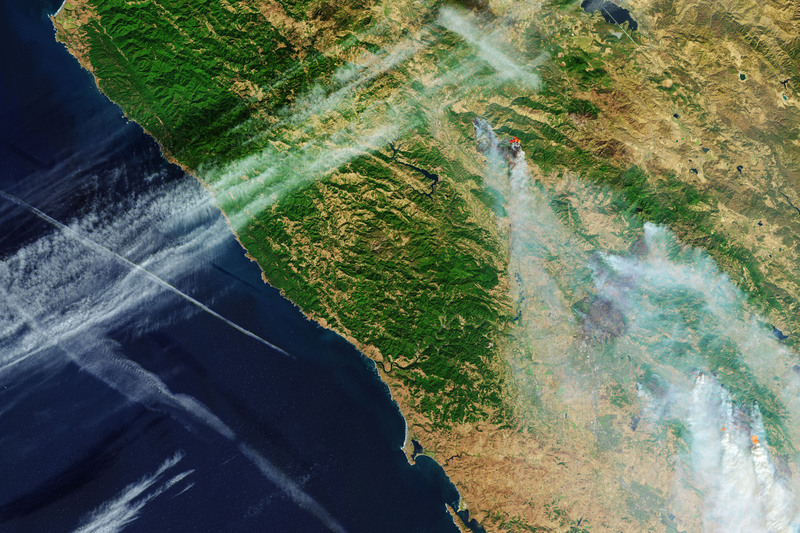 On October 11, the Operational Land Imager (OLI) on Landsat 8 acquired the data for these false-color images of the fires near Santa Rosa and other communities in Northern California. The images are composites combining shortwave infrared, near-infrared, and green (OLI bands 6-5-3) with natural color (bands 4-3-2) and a thermal infrared signature (TIRS, band 10). These combinations make it easier to see through the smoke to the burn scars and the still-active fires. In the past week, 21 wildfires have ignited in Napa, Sonoma, Solano, and Mendocino counties and other communities north and east of San Francisco Bay. Fanned by northeasterly Diablo winds, the fires have collectively consumed at least 170,000 acres (265 square miles) of land—an area about half the size of the city of Los Angeles. The most prominent events include the Tubbs fire (between Santa Rosa and Calistoga), which has burned more than 34,000 acres; the Atlas fire (near Lake Berryessa, off the lower right of our image), which torched 44,000 acres; and the Redwood/Potter fires (near Mendocino National Forest, north of this scene) with 32,000 acres burned. Part of the Adobe fire (about 8,000 acres) appears in the lower right of the image, near Kenwood. CalFire and local officials reported that at least 3,500 homes and businesses have been destroyed, and thousands more are being threatened. Tens of thousands of people have evacuated, and thousands of firefighters have been sent to stop the spreading flames. As of the morning of October 12, most of the fires had little or no containment, according to CalFire bulletins, and “red flag warnings” were still being raised for fire weather with low humidity and high winds. CalFire (2017) Current Fire Information. Accessed October 12, 2017. San Francisco Chronicle (2017, October 12) The latest on the Wine Country fires. Accessed October 12, 2017. NASA Earth Observatory images by Joshua Stevens, using Landsat data from the U.S. Geological Survey. Story by Mike Carlowicz. MODIS and CATS Imagery from Oct 11, 2017 Showing Smoke Over San Francisco Bay Area.